Where Did Skip Bins Start? We take a lot of everyday items for granted. How often have you stopped to think about how something you use every single day – be it a table, a boot, a keyboard, or a car, and wonder how it came about? Skip bins have been around for a pretty long time, and over the years have become a staple in clean-up and renovation projects. From baskets to lorry cargo, to skip bins and mini skip bins – how did these things become so widely used? In honour of this item being used every day but not often appreciated, here are 6 things to know about skip bins. According to the Chambers Twentieth Century Dictionary, the term ‘skip bins’ actually originates from the Old Norse word skeppa, meaning basket. This word evolved over the years, found new uses, until we have the word for skip bins today. Makes sense calling what is essentially a giant wastebasket a basket, doesn’t it? 2. How did the skip bins themselves come about? The entire history of skip bins still remains somewhat of a mystery but some sources say that skip bins are modelled after old mining carts and mining boxes. That makes sense as mining carts have pretty much the same design and use – rectangles or trapezoids, sometimes wheeled, sometimes not, and both used for moving heavy loads of loose material. 3. Skip bins are a design genius! Speaking of modern skip bins, their designs are simple but efficient. This makes skip bins affordable and convenient to use. Think of the shape – the top wider than the base. This means that it can take in a lot of things while not taking up too much of precious floor space. The hinged doors in some bins prevent spillage. The slope on the walls of the skip bin allows for the easy loading of materials. The skip bin is simple, yes, but also effective at doing its job. Over the decades, different types of skip bins have developed and each of them has different advantages. Open skips– these are some of the most common. Open-topped skip bins allow large amounts of waste to be loaded. Mini skips– as the name suggests, these are smaller skips and are easily loaded, transported, and empty. They’re often a lot cheaper, too! Closed skips– these have doors that aim to prevent unpleasant odours from seeping out, and prevents rubbish from spilling. Walk-in skips– these are larger skip bins that are open on one side to allow easy loading of items. Imagine a walk-in closet. Different jobs and clean-up projects will of course demand different sizes of skips. Moving residences will need larger skips, perhaps a walk-in skip bin. A yearly garage clean-up, on the other hand, will most likely just need a mini skip bin. Sizes can range from 2m3 to 3m3 for mini skip bins, walk-ins range from 1m3 to 6m3, and the largest bins can go above 10m3. Try to estimate how much waste you’ll be throwing out before choosing a skip bin hire. These large boxes for garbage disposal are known as skips or skip bins in the UK and Australia, and as dumpsters or dumps in the United States. They have the same use though. What’s more, skips have seen wide use in clean-up projects – be it house renovations, business clean-ups, and more. Our company offers excellent quality skip bins and services to help you out with your waste disposal requirements. Our skip bins are of various sizes and are suited for any type of project you require. 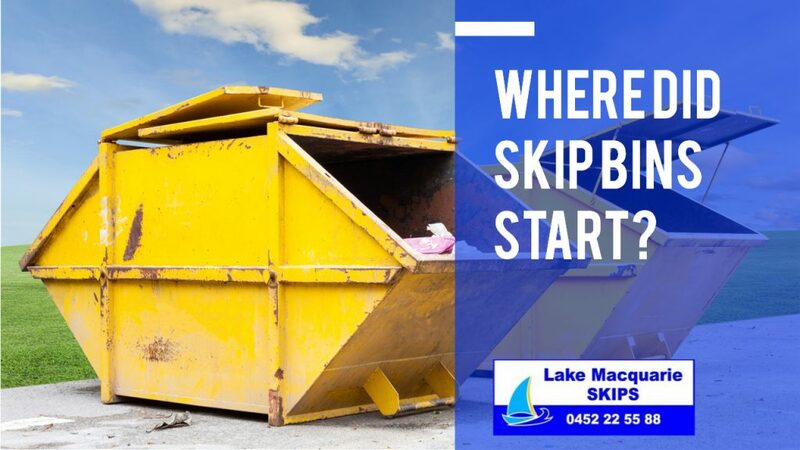 Book a skip today at Lake Macquarie Skips!